It's been an interesting four years for Mac-based audio engineers and musicians since Apple acquired Emagic, so this month we take the opportunity to acknowledge the anniversary and consider what's changed over this time and what's still to come. Four years ago this month, on July 1st 2002, Apple announced that they had purchased Emagic, which was a pretty surprising announcement for most in the audio and music worlds. We covered the story in detail in September 2002's SOS (www.soundonsound.com/sos/Sep02/articles/emagic.asp) and concluded that "with Apple behind them, Emagic are potentially better placed than ever to deliver products for musicians which are optimised for a specific platform. Only time will tell, however, whether this potential will be realised." In the four years that have passed since we wrote that comment, has this potential been realised? How have the other companies fared that Apple acquired during the same period? And do their fortunes have any implications for Mac-based musicians? Apple acquired Nothing Real and their Shake compositing software in 2002. 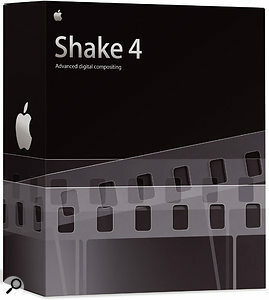 Four years later, it looks as though Shake 4.1 will be the last release of the software. Emagic wasn't the only company acquired in 2002; earlier in the year Apple had also bought three other companies involved in video compositing and other video-related effects: Nothing Real, Silicon Grail and Prismo Graphics. Nothing Real gave Apple Shake, an acclaimed compositing application used in high-profile motion pictures such as Lord Of The Rings. It's interesting to note that Shake was only available for Windows, Linux and IRIX (for Silicon Graphics workstations) at the time of Apple's acquisition. A Mac OS X version came a year later, but the Windows version was discontinued (as with Emagic's Logic), along with the IRIX version. Apple maintained the Linux version because, while the company might stand a chance of persuading some Windows Logic users to buy a Mac to run their former sequencer of choice, film studios tend to run Shake on hundreds of systems and would be unlikely to replace this level of investment with Macs. To capitalise on this situation, when Apple added the ability for Shake to distribute rendering tasks across multiple computers on a network, Mac users got the ability to run the 'node' software on as many Macs as they wanted for free, while Linux users had to pay for a per-node license to do the same. This was an obvious example of Apple's strategy of using the 'Pro Applications' (of which Shake was one) to drive sales of Mac hardware. Silicon Grail was a notable purchase because the company was a competitor to Nothing Real in compositing software, but also offered effects and other layering technology. Prismo Graphics also owned some video effects technology, but their main product was one for creating motion graphics, such as titles. 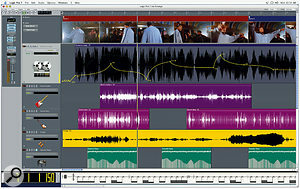 With the release of Final Cut Pro 4, in 2003, Apple bundled three new applications, including Live Type, a video-titling tool that probably used some of the technology acquired from Prismo Graphics, and Soundtrack, an audio application for adding loop-based soundtracks to video productions. (The latter was later made available as a product that could be purchased separately.) Final Cut Pro 4 also bundled a package called Cinema Tools (the result of a previous acquisition) that Apple had originally sold at $999 as a companion to Final Cut Pro. In 2005, however, Apple took bundling to a whole new level, putting together Final Cut Pro, DVD Studio Pro, Motion (a motion graphics application introduced a year earlier) and a new version of Soundtrack (now known as Soundtrack Pro), to create the Final Cut Studio bundle. This sold for the bargain price of $1299, which was significantly cheaper than buying the products separately. Apple would later stop selling the individual products. Although the reason Apple might have for killing one of its flagship professional applications is still a little unclear, a next-generation compositing application is apparently in development. However, one rumour is that this won't be introduced until 2008, so Apple are leaving a fairly big gap between Shake and whatever comes next. It's worth remembering that, in addition to selling the Shake software since 2002, Apple also continued to sell maintenance support for Shake, unlike any other professional application in the product line, which is one reason why it was worthwhile to keep all the Linux users happy until now. On the surface, it seems as though the company want to draw a line in the sand and start afresh with a completely new system. 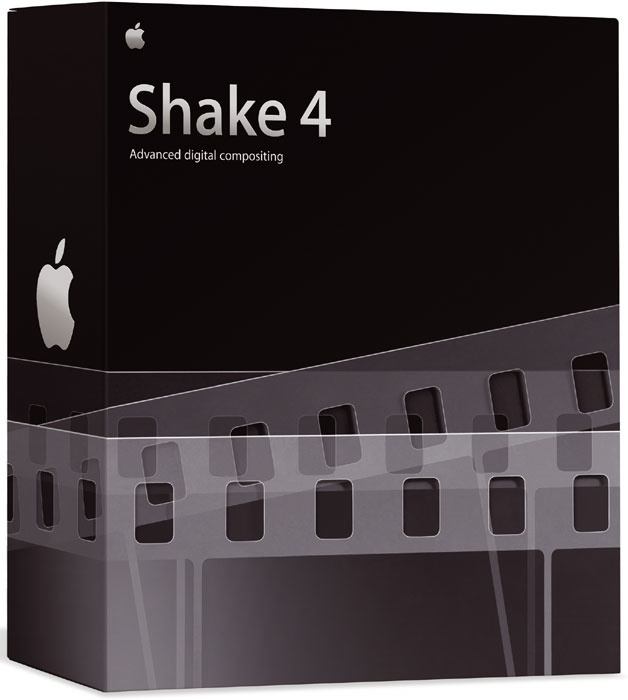 In order to reduce the impact of Shake 's demise for high-end users, such as film production studios, there's apparently a source-code license available for a not-insignificant price tag. Shake also has a fairly flexible SDK (Software Developer Kit) to allow third parties to extend the functionality of the application. So it seems that while Apple wanted to end their responsibilities with Shake, they've been careful to make sure that users are left in a good position until the 'next big thing' arrives. In our original article looking at what was going to be in store for the Apple and Emagic relationship, we based our predictions for Emagic's future on what Apple had done with their video-orientated acquisitions. 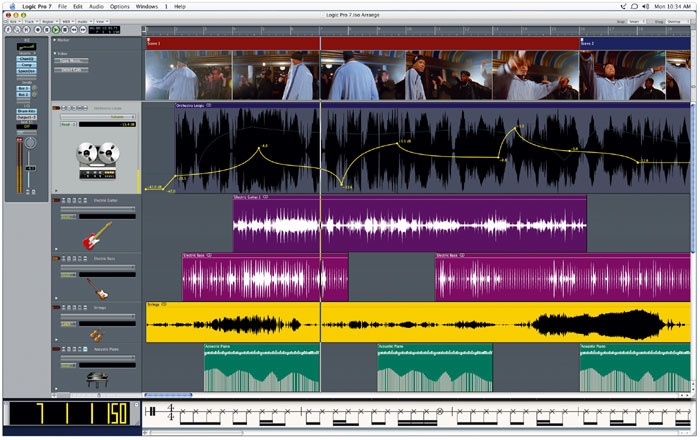 Final Cut Pro and DVD Studio Pro led to iMovie and iDVD in the consumer space, so it seemed reasonable to expect an 'iLogic'-type application, which of course was later introduced as Garage Band. Since its release two and a half years ago, Garage Band has made a huge impact on the consumer MI (musical instrument) industry, both in terms of the explosion of low-cost MIDI and audio accessories from companies such as M-Audio (who have now produced a Garage Band clone called Session, to try to achieve similar growth in the Windows world), and in terms of the content that has been produced or repackaged for Garage Band in Apple Loops format. Final Cut Pro is also available in a cut-down form (both in terms of features and price) as Final Cut Express, so the simplification of the Logic product line from Micrologic AV, Silver, Gold and Platinum versions to just Logic Pro and Logic Express was also quite predictable. However, what wasn't quite so predictable was Apple discontinuing Emagic's line of plug-in instruments and effects and bundling all of them with Logic Pro 6, and some of them with Logic Express 6. (It probably wasn't worth Apple's while to manage so many small products and the associated dongle authorisations for copy protection.) In view of Logic Pro 's $999 price tag, this was a huge saving, and users upgrading from previous versions could get all the plug-ins for a couple of hundred dollars. Great — except if you'd bought all the Logic plug-ins separately before this happened! Of course, this bundling is a direct parallel to what happened with both Final Cut Pro and Final Cut Studio, and while Apple obviously make money selling software, they make a great deal more money by selling new Macs to Logic users who are looking for more power now that they have more plug-ins to run! This action reminded us again that Apple are a hardware company, and it certainly puts pressure on third-party developers to follow suit; except how can they? If Steinberg bundled all of their optional plug-ins with Cubase, the company would lose a chunk of their income. Steinberg are a software company, after all. Would MOTU have included a new set of instruments as a major selling point for the recent Digital Performer 5 upgrade if Apple hadn't thrown down the gauntlet? And would Digidesign have bundled Xpand! (the first instrument created by the company's new Advanced Instrument Research division) if no other music-making application bundled significant instruments? Whatever the reason, the trend of increasing the value of these products (without increasing the price) has definitely created a win-win situation for the users — assuming that the software-only companies can stay in business, or justify creating Mac-compatible versions. With the introduction of the first major new version of Logic under Apple's ownership, Logic 7, the Emagic web page disappeared and Emagic's hardware products were quietly discontinued. Fortunately for Mac users, though, while the Windows drivers have languished, Apple continue to update the drivers for Emagic's old hardware devices under OS X, and it's a great relief to still be able to use the Unitor 8 and AMT8 with Intel-based Macs. Logic Pro 7 also introduced the concept of Logic Node, where you could network a group of Macs together and offload certain processing from your main Logic system to the other Macs on the network. This concept seemed similar to Apple's video applications, where compression or rendering tasks can be offloaded to other Macs on a network, and you can almost imagine the directive given to Logic 's programmers to implement a similar technology for audio that would encourage the sales of more Mac hardware. In terms of Mac technology, a great deal has happened in the last four years: the introduction of the G5 in 2003 and the availability of Macs with Intel processors at the start of this year, to name just two milestones. In both of these cases, Logic has, of course, been in a position to be the first application of its kind to take advantage of such new technologies, and for Logic users this is obviously a great thing. So Emagic was indeed "better placed than ever to deliver products for musicians which are optimised for a specific platform." Logic Pro 7 was the first major new release of the application since Emagic's acquisition by Apple.However, there's one area of improvement where Logic still hasn't quite caught up: full support for the multiple cores available in the high-end Power Mac Quad. Although there are some benefits to running Logic on a Power Mac Quad, Logic 's audio engine only runs on two of the four cores (which has nothing to do with the fact that Logic 's multiprocessor handling is derived from the OS 9 days, as some have suggested). This means that it can't handle quite as much DSP processing as the Mac version of Cubase, for example, which launches an audio engine on all four cores. From what I understand, the lack of Quad support so far is a conscious choice that was made so that more resources could be given to optimising Logic for Intel-based Macs, as we've discussed in previous columns; but assuming there will be a dual-core, dual-processor, Intel-based Power Mac replacement this year, hopefully Logic will be poised to take advantage of this extra power. But does the decision to optimise first for the new portable and consumer Intel-based products mean that Apple doesn't regard Logic users requiring high-end Mac hardware as a priority? And if so, is this necessarily incorrect? How many musicians are running Power Mac Quads? We'd need a survey to know for sure. That Apple would 'retire' Shake raises at least a concern for Logic users, but there's an important difference between the two apps, in that there are more unique users of Logic than Shake: in the case of the latter, there are single users who buy a large number of licenses. However, that Apple would consider creating a next generation of compositing software does raise the question of whether there will ever be a post-Logic audio and music application from Apple. Or will they simply continue to improve Logic, as they did for version 7? Perhaps Logic Pro 8 will go some way towards answering this question. In the meantime, I think Logic is safe with Apple. Even if Garage Band represents the future of mass-market music-making, once a musician outgrows it they need somewhere else to go — and the only way Apple can guarantee that they stay with the Mac is by making sure the Garage Band user buys Logic. There might be other Mac music software today, but Apple controls the destiny of Logic to ensure there is always a high-end music and audio package on the Mac. This theory actually plays out, even at the moment, when you consider that every update to Logic includes features to make it compatible with songs created in the latest version of Garage Band. And some of these features have actually benefited the high-end user, such as Apple Loops, in a rare example of the low end driving the high end, as opposed to the other way around. Outside the professional applications, there's been another important development since Apple acquired Emagic: the iTunes Music Store, which has fuelled the growth of Apple's consumer music products. To this end, Apple can now control almost every step of a music and audio workflow, from creation to distribution, and for the most part has continued to endear itself to professional musicians and consumers alike. At the end of the day, along with Garage Band, these might have been the most valuable assets Emagic contributed to Apple.